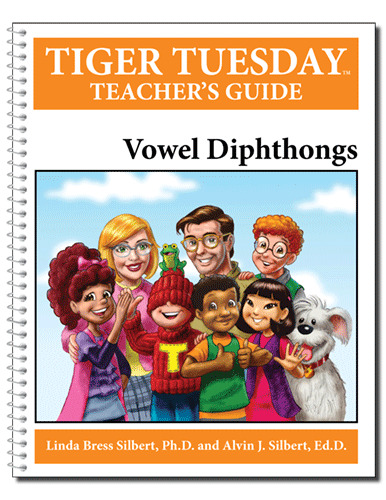 Get the Most From the Tiger Tuesday Diphthongs Module! The Tiger Tuesday Diphthongs Module includes a cornucopia of learning opportunities, with the primary focus on learning of the most commonly used dipthong patterns and acquisition of skills in identifying and decoding words in which diphthongs occur. To facilitate learning, the Diphthongs Teacher’s Guide contains detailed lesson plans, step-by-step recommendations for moving from activity to activity, and directions for fluidly presenting stories, activities, plays and games included in the module. The lesson plans may be followed in sequential order, in an order you see as useful, or with individual students.